Kaynemaile-Armour is a uniquely modern re-imagination of the two thousand-year-old chainmail concept using strong (yet lightweight) polycarbonate. 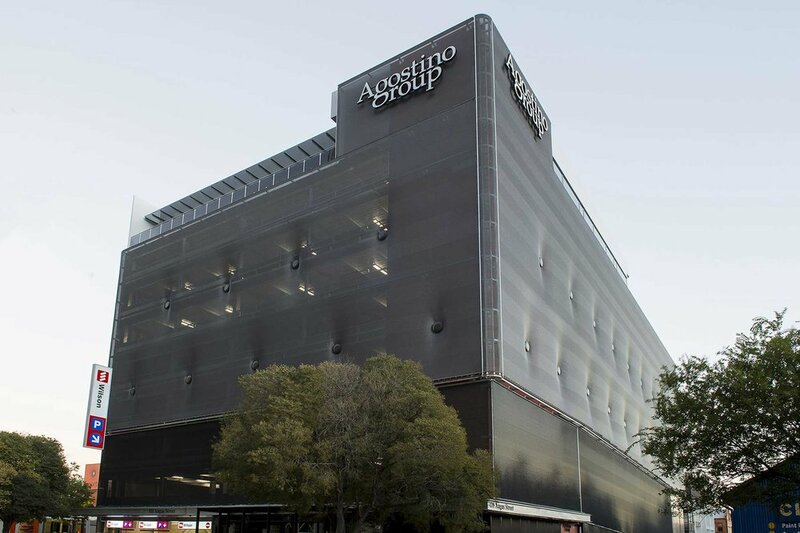 Kaynemaile-Armour has created stunning architectural features on several unique car park facades locally and internationally. Kaynemaile-Armour provides significant environmental benefits, spectacular visual appeal and a wide scope for design. It also comes with the added benefit of maintaining visual transparency from the inside out. One of the unique properties of Kaynemaile-Armour is its solar reduction capabilities. By protecting a building from direct sunlight and not restricting the cooling effects of air movement, Kaynemaile-Armour significantly reduces the total energy costs required to cool a building in hot climates. The three-dimensional structure of the mesh means a high proportion of the surface area is always in shade, giving a cooling effect as the air passes through the cross-sectional open area. It significantly reduces both radiant and thermal conductive heat from entering the building envelope by up to 70%. Unlike steel mesh products (that can store significant amounts of heat), Kaynemaile-Armour mesh remains at a near ambient temperature to protect the building from heat conduction. Utilizing the latest polycarbonate manufacturing technology (the same material used in aeroplane windshields and astronaut helmets), Kaynemaile-Armour is extremely robust and impact resistant. It weighs only 3kgs per square metre so it doesn’t need the same amount of structure and fixings as a metal facade. Kaynemaile-Armour was recently installed on the Loma Linda University car park facade in San Bernardino, California. The hot, dry climate of San Bernardino meant sun protection and airflow were critical requirements in the design. The Kaynemaile-Armour facade system significantly reduced the surface temperature from 40°C to 28°C in Kaynemaile-Armour protected areas*. With a fast install time and simple fixing details, Kaynemaile-Armour exceeded the project requirements — providing enhanced air flow through beautiful louvre-like strips. 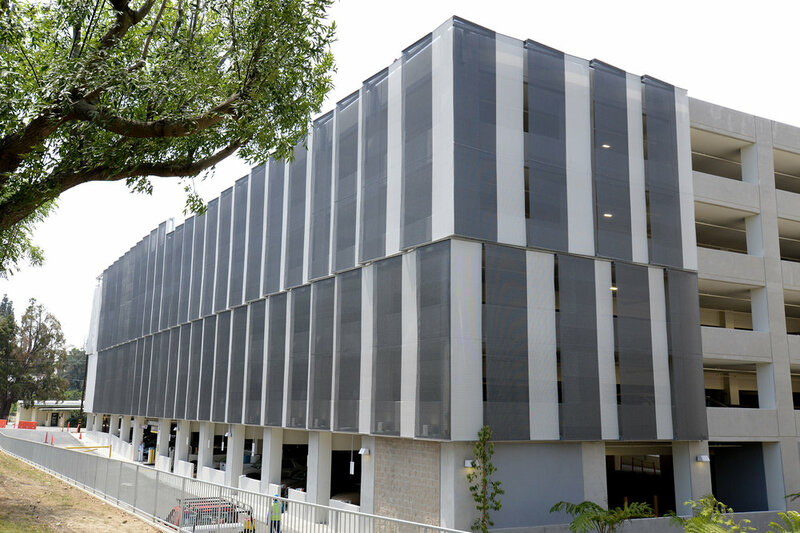 The mesh was also used on the Pacific Fair Shopping Centre car park facade on the Gold Coast. Using a material that cut heat but maintained air flow in this sub-tropical climate was crucial for this project. The design drew inspiration from the waves and golden sand of the nearby Pacific Ocean the three-dimensional facade features two layers of mesh, providing a different scene from day to night along the busy boulevard. During the day the sun sparkles off the ten million individual rings of the champagne coloured front screens. At night the rear layer of translucent marine coloured mesh creates a rippling wave, highlighted by well-placed architectural lighting as well as the ocean breeze. Another unique characteristic of Kaynemaile-Armour is that it can be made to any height or width in a seamless piece (thanks to a patented manufacturing process). This meant the mesh easily worked with the pre-determined structural frame heights for Pacific Fair and gave the designers the flexibility they needed to explore new and interesting concepts. * This may vary from geographical location and claims are based on a combination of scientific tests, field readings, observations and weather conditions. Loma Linda University Carpark: The hot, dry climate of San Bernardino meant sun protection and airflow were critical requirements for the facade. Loma Linda University Carpark: The Kaynemaile-Armour facade system significantly reduced the surface temperature from 40°C to 28°C in Kaynemaile-Armour protected areas*. Kaynemaile mesh uses self-extinguishing fire retardant polycarbonate to achieve a Group 1S result in the ISO 9705 room test. For more specific compliance information, please contact us. For more information on fire resistance and other benefits of our mesh, visit our Technical page.